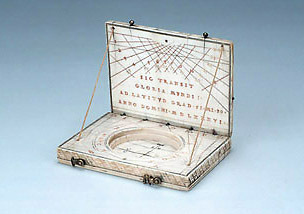 This is an example of a diptych dial in the form of a book. On both the outer faces are engraved coloured figures: on the upper leaf, St. Helena holding a cross in her right hand, and on the lower leaf, Constantine (Helena's husband, father of the Emperor Constantine). Constantine is depicted as a bearded man in Roman armour, and holds a pennant in his right hand. The actual dial has two different strings, marking common hours respectively from 4 a.m. to noon and from noon to 8 p.m.